Reveal the music as it truly sounds. 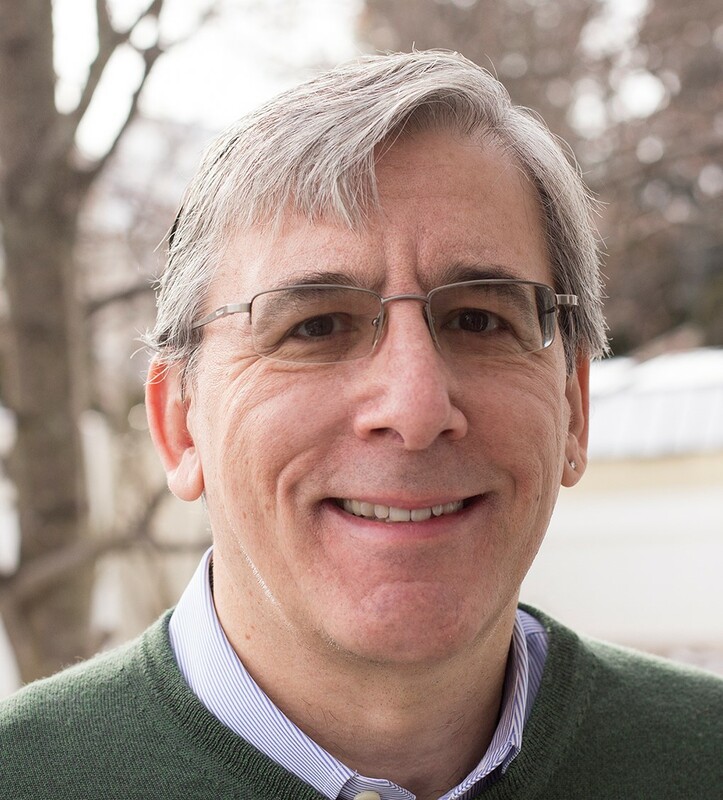 In a recent blog posting entitled “How We Interpret Sound,” famed acoustics expert Dr. Floyd Toole stressed the importance of listening to music through neutral loudspeakers — that is, speakers that have a flat frequency response, so they aren’t coloring the sound. This is something that’s probably even more crucial when recording or mixing music, because you need to be able to trust what you’re hearing — especially if you’re working in a home studio, which typically has little or no professional acoustic treatment. If your monitors (the common term for studio speakers) aren’t providing you with an accurate representation of the frequency content of your music, it will adversely affect your ability to record and mix successfully. And if your finished mixes sound good in your studio but nowhere else, odds are that your monitors are at least partially at fault. Speakers intended for use in the home or in the car often hype specific frequency ranges to make music more exciting to the listener. 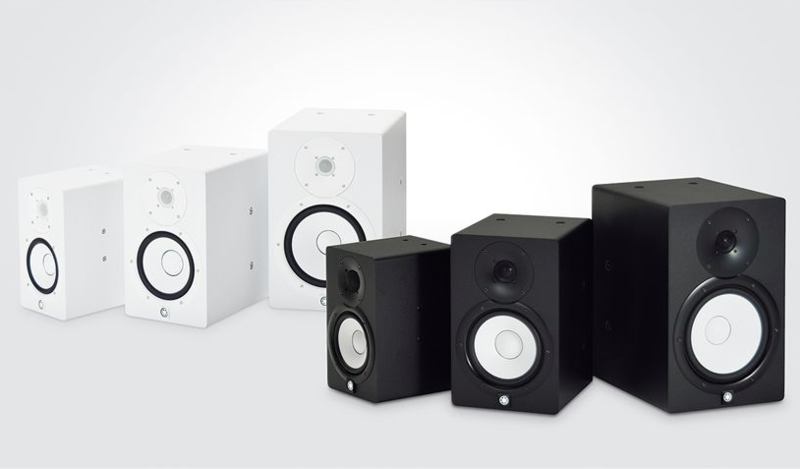 However, quality studio monitors are designed to reproduce sound accurately. They reveal the music as it truly sounds so that you can adjust the frequency balance with confidence, assured that your productions will translate everywhere they are heard. Here’s what happens when you create a mix while listening on speakers that accentuate the bass and the treble ranges: You set the bass instruments — mainly the bass guitar and kick drum—at what seem like the right levels, based on what you are hearing, and you use EQ to reduce the highs on some of the sounds that seem overly bright. Makes sense. But the problem is, when you listen to that mix on other systems, it’s all out of whack, with too much bass and too little high end — a boomy, dull mess. This didn’t occur because of your ears or your mixing skills; it happened because of your monitors, which made it difficult (if not impossible) to gauge the frequencies correctly. You mixed based on what you were hearing but what you were hearing was inaccurate. That experience is akin to an artist trying to paint colors correctly while wearing orange-tinted glasses. It’s virtually impossible. So neutral monitors are vital when mixing, but they’re equally important while tracking. After all, the sound you hear in your speakers will influence how you position microphones or set equalizers. If your monitors are inaccurate, you’re more likely to make bad decisions all around. Yamaha makes two different monitor lines: the MSP Studio series and the HS series. All are self-powered, two-way, bi-amplified loudspeakers (which means there are separate power amps for the woofer and the tweeter), and they come in a variety of sizes: 7″ and 5″ for the MSP Studio series; and 8″, 7″ and 5″ for the HS models. The larger sizes offer extended bass response, but the smaller models can be better for space-challenged studios or studios on a budget. An optional subwoofer, the HS8S, can be added to any of these to take bass response down to 20 Hz. The Yamaha HS series monitors are designed to reproduce audio without coloring it. Professional studios are constructed so that their acoustics don’t distort the frequency response of the monitors. In a home studio, however, you’re generally working in an existing space, not a purpose-built one. Adding acoustical treatment can be expensive and may require invasive installation onto walls and ceilings in ways that might not be practical in many living situations. Fortunately, most loudspeakers made for the home studio are near-field monitors, which are designed to help minimize problems caused by room acoustics. The concept behind near-field monitoring is that the listener is able to sit close enough to the speakers so that he or she hears mainly the direct sound coming from them, and a relatively low percentage of reflected sound from the walls, floor, or ceiling. Near-field monitoring won’t eliminate all acoustical issues from your studio, but it will help lessen their impact. Where you position your monitors is vital for ensuring accuracy. First, unless you have no other options, don’t place your monitors in corners or right up against a wall; try to set them at least five feet away. In addition, set up your monitors in an equilateral triangle, with your listening position (where the back of your head will be) at one point and your monitors at the other two. Ideally, the left and right speakers should be the same distance from each other as they are from the wall behind them. If you can, set up your listening position so that it is centered between the walls to your left and right but not centered between the front and back walls. The monitors should be angled inward equally (at roughly 30 degrees), so they’re pointing right at your head, which shouldn’t be more than a few feet from either speaker. (The less distance there is between your ears and the monitors, the less your room acoustics will interfere with what you’re hearing.) 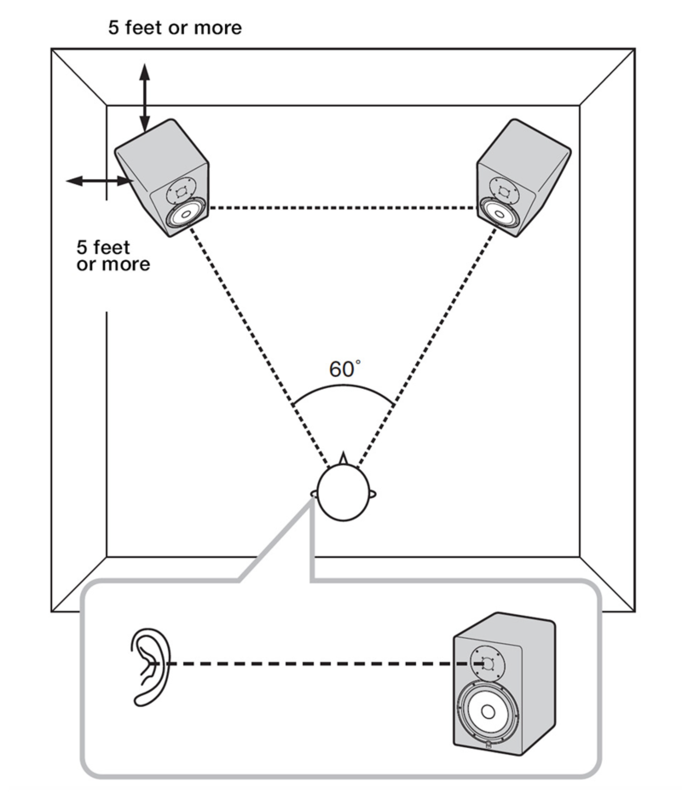 Additionally, because high frequencies can be quite directional, for the most accurate monitoring the speakers should be set up so that the tweeters are at approximately the same height as your ears when you’re seated at the listening position. Correct near-field positioning minimizes the effect of room acoustics. It’s also a good idea to use isolation pads, available commercially from a variety of sources. These go under your monitors and decouple them from the surface they’re on. They help reduce the chance of sympathetic resonance developing that could overly boost or otherwise interfere with low-frequency response. Although properly configured and positioned near-field monitors will get you a long way towards the goal of neutral (and therefore accurate) monitoring, the specific physical aspects of your studio might still interfere enough to distort their accuracy. Fortunately, Yamaha HS and MSP monitors are equipped with a number of controls for adjusting both the high- and low-frequency response. 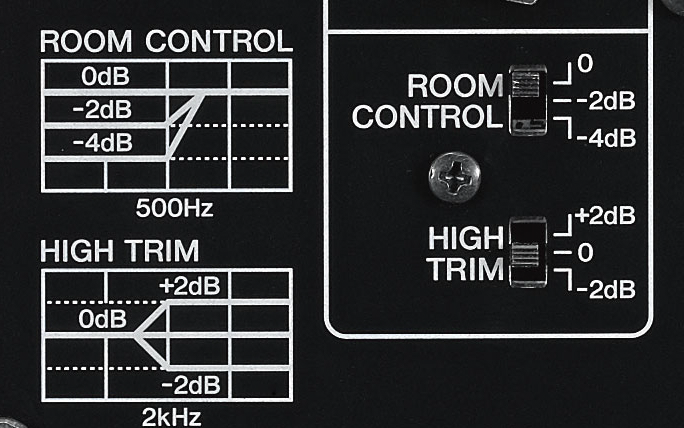 Room Control and High Trim switches on the back of the HS monitor allow you to match response to room acoustics. For example, the Room Control on HS monitors is specifically designed to reduce the low-end build-up that can result from monitors that are placed too close to a wall, while High Trim enables you to boost or cut the high end as needed. The bottom line is this: When you use quality monitors and place them correctly, you’ll be able to enjoy the benefits of a neutral monitoring system. You’ll hear the frequencies in your music more accurately, and your mixes will translate better. As a result, you’ll be able to concentrate more on making music … an end goal well worth pursuing! Click here for more information about Yamaha studio monitors.